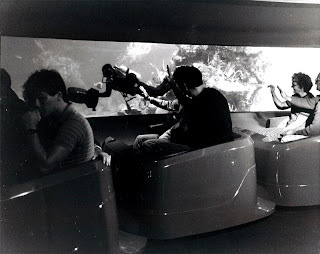 Many guests have been drawn back into The Living Seas, I’m sorry, I mean The Seas with Nemo and Friends by the recent addition of the omnimover ride through Nemo’s big, blue world. The clam-mobiles, Doombuggy type vehicles shaped like seashells, move guests through animated, figure filled environments and, finally, past real aquatic environments. This isn’t, however, the first time guests have taken such a trip in Epcot. Once upon a time, a trip to The Living Seas led to Seasbase Alpha. Such a journey began with an exhibit of artifacts from nautical history and the live action film 20,000 Leagues Under the Sea, a brief film entitled The Seas, a trip aboard the water elevators known as hydrolators, and then a journey aboard a seacab. The blue omnimover vehicles known as seacabs had a rounded nose rear corners that turned up, giving them a distinct ray feel about them. Unlike the current attraction, however, the seacabs show scenes were only those of the ocean environments, often anchored by coral reefs. Hosted by the knowledgeable commander of Seabase Alpha, Commander Fulton, the trip took only a few minutes, but passed by a possible 6,000 aquatic creatures, including various fish, dolphins, sharks, eels, and crustaceans. Alas, Commander Fulton was called away before he could greet the visitors to the Seabase, and he has long since been retired. The seacabs ushered in their last set of guests in 2001, but luckily for us the marine life that inhabits the various environments still occupy the pavilion and guests are still able to marvel at these incredible creatures.